Love timeless beaded jewelry? Be inspired by the romantic and vintage-insprired designs of the Featured Artist: Kelly Wiese. Bead her Crystal Medallion Bracelet with the included bead kit and be inspired to create more of her designs as you browse the pages of her eBook and watch her DVD and video download. Stitch up a little romance! Celebrate the month of love with romantic and timeless beading designs from the February Featured Artist: Kelly Wiese! Follow along to create vintage-inspired jewelry alongside Kelly in her Beadwork Designer of the Year DVD and in her video download featuring the Victoriana Necklace. This exclusive collection features elegant beaded jewelry designs, expert instruction from Kelly, and a bead kit so you can make the Crystal Medallion Bracelet at home! Hurry, there are limited quantities available! Explore a romantic aesthetic with Beadwork Designer of the Year, Kelly Weise. In this workshop DVD learn the steps for stitching vintage-inspired components, how to create beautiful beaded bracelets, earrings, necklaces, and rings. Plus, discover several techniques for adding embellishment to your pieces. With 6 expertly designed beadwork projects, you will build your beadstitching skill and enjoy exploring a variety of techniques. Each project features illustrated step-by-step directions, companion images, and detailed material lists for easy start-to-finish projects. Bring your beading to the next level with rectangular crystals secured in a beaded bezel. Learn how to make elegant Victoriana Necklaces and enjoy expert Kelly Wiese’s instruction on constructing a necklace from start to finish with helpful hints along the way. 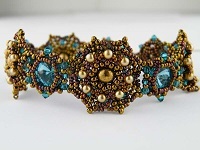 Make the gorgeous Crystal Medallion Bracelet designed by Kelly Wiese! Don’t wait—Order your collection today!